Sometimes, historical markers are massive, freestanding objects, obvious to all passersby. But just as often, they are small, inconspicuous plaques, commemorating small and large pieces of our history. They can be hidden in plain sight and barely be noticed. This is the Howard M. Metzenbaum United States Courthouse, known to some of us as the United States Post Office, Court House, and Custom House. (This would be the same "some of us" who refer to the baseball stadium as Jacobs Field.) 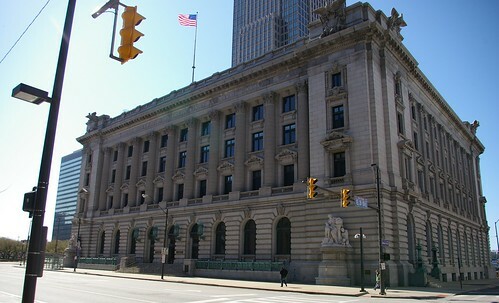 It is located at 201 Superior Avenue, N.E., in downtown Cleveland. 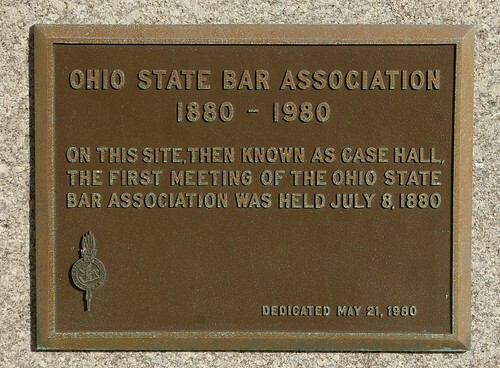 On this site, then known as Case Hall, the first meeting of the Ohio State Bar Association was held July 8, 1880. Case Hall, built in 1867, was a popular gathering place. It featured an auditorium, and for a time, housed Cleveland's city hall. It was demolished to make way for the courthouse. We believe that the best way for Cleveland to move into the future is to engage with the past. Let us be your guide to those local people, places, and events that made Cleveland and Northeast Ohio unique. Order from Amazon, Barnes and Noble, or your favorite independent bookstore. Langston Hughes house - CONDEMNED!